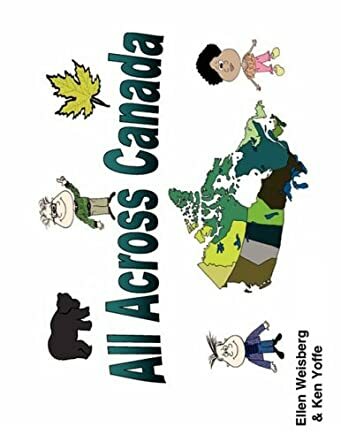 All Across Canada by Ellen Weisberg and Ken Yoffe takes young readers on a beautiful tour of Canada, the second largest country in the world. The lakes, rivers, mountains, and tundra add to the beauty of this country where around 32 million people of diverse backgrounds and cultures reside. Wandering Wally, Hiking Holly, and Ambling Andy will take readers through Canada's thirteen provinces and territories. Readers will also meet their friends as they go on the trip. This fascinating journey through Canada will introduce readers to many new things and educate them about the country, its culture, and various other interesting attractions. The book is definitely a must-have for all school and public libraries. It's a good source for reference and it's not only for children but also for adults. The rhyming verses and the colorful illustrations make it appealing to children and make learning fun and enjoyable. It's also a good bedtime storybook for children, and parents and grandparents can teach a lot of new things to their kids and grandkids by reading it out during bedtime. Teachers and educators will find it helpful to teach children about new countries and places, and it can be used for read aloud sessions in classrooms and school libraries. The trip with these three friends is so real that one gets a feeling of actually being there in Canada and experiencing everything first hand. Traveling is an education in itself and that is exactly what this book tries to tell us. It's a lovely book that will encourage readers to travel and explore new destinations.